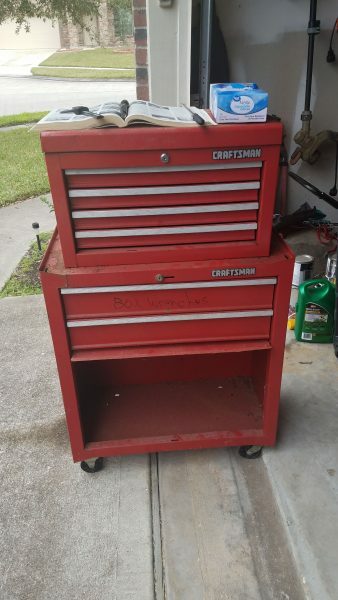 A family friend gifted me a well used Craftsman toolbox. I haven’t been able to find a model number, but I guess it really doesn’t matter. I’m planning to restore it close to its former glory. I’m not a professional metal worker, so it’ll still have some bends, dents, and dings but I’m going to do the best I can. I plan to strip it down to bare metal, remove the underlying rust, then prime and paint as close to Craftsman red as I can get. But I am going to paint the drawers black instead of the original red. I like the way the newer Craftsman boxes have the black drawers against the red cabinets. My only big question is: what to do about the inside of the cabinets? I’m not sure I want to strip/rust treat/prime/paint/clear the interior of the boxes. I’m afraid I may not cover all the metal and just reintroduce the rust. I may just scrub them out really good, plug the cracks and drain holes from the outside and give it a good few coats of rust reformer and call the inside good. No one will ever see the inside anyway. Then when I do the outside, I’ll seal all the openings from the inside so it won’t get stripped away. Any one out there have an opinion on how to tackle the interior of the boxes?